A working seat belt in a rollover accident may be the difference between life and death. Seat belts in rollovers when working as designed keep the occupant inside the vehicle in the “safest” areas in rollover. If the seat belt buckle is defective and unlatches or the retractor spools out and allows too much slack in the webbing, or the pre-tensioners fail to take in the extra slack in the belt, then catastrophic injuries can occur in all sorts of accidents and rollovers. If the seat belt buckle unlatches during a rollover, then the occupant is often ejected out a window, sunroof or out an open door onto the highway pavement or onto the ground at 20-50mph. Ejection during a rollover at these speeds if often deadly or with resulting catastrophic spinal cord and head injuries. As discussed above seat belts, are perhaps the most important automobile safety advancement in the past hundred years. 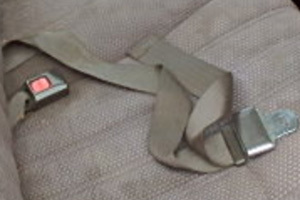 The National Highway Traffic Safety Administration (NHSTA) estimates that between the years 1975 and 2001, approximately 150,000 lives were saved by the seat belt, a number which underscores the importance of a functioning and reliable seat belt as one of a vehicle’s primary safety features. Unfortunately, improperly designed or constructed seat belts can fail, putting drivers and occupants of vehicles in extreme danger. 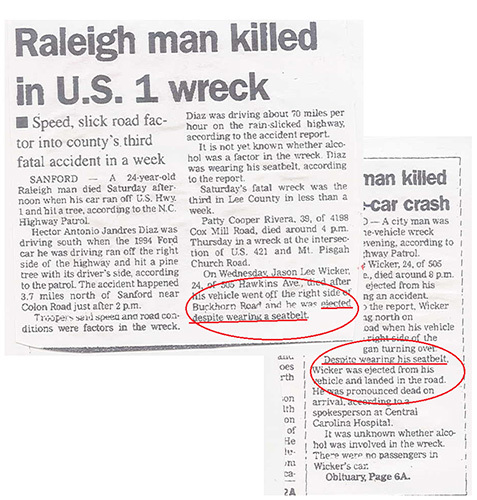 Our law firm has represented dozens of injured victims and families of those victims in rollovers and accidents which the seat belt failed to restrain them allowing them to be ejected or allowing them to impact their head and spinal cord / neck roof of the vehicle or a roof pillar or impacting the ground or pavement when ejected. In one such case a husband and wife were T-boned by another vehicle in his Chevy pickup and he was rendered a quadriplegic when his seat belt buckle failed to stay latched and opened upon impact allowing him to impact his head on the truck’s roof and roof support. His wife remained belted and walked away from the accident with no injuries. Upon inspection of a seat belt expert engineer, it was determined that his seatbelt buckle was latched and failed to restrain him. A seatbelt buckle defect lawsuit was filed and settled out of court. In another seat belt defect case of this law firm, a young man and his band were driving their van when the rollover accident occurred. The belted driver was left an ASIA D C-4 Quadriplegic when his seat back hinge broke during the rollover and he was ejected into the back of the van, even though he was belted. The seat back failure caused the back of the seat to flatten out subjecting him to be launched rearward, although the seat belt was still fastened, but now suspended in mid air, not against his body and offering no protection. A product liability lawsuit was filed and later settled out of court. Another Willis law firm case a young man’s SUV was clipped or hit by another car causing his vehicle to spin out and roll over off the pavement resulting in a rollover and his ejection. He suffered a severe closed head injury. Though the investigating highway patrolman /police cited him for no belt usage, our seat belt buckle expert determined the belt was properly worn and the buckle released during the rollover. In another Willis case a young woman was in the back seat of her friends car, when the driver in a construction zone, hit a ditch. All occupants were belted and unhurt, except our client that was wearing the lap belt in the back seat. The impact of the collision caused he head to rapidly come forward as her body jack-knifed forward. Her head hit the back of the front seat, breaking her neck at the C-5 cervical disc resulting in her paraplegia. A seat belt defect lawsuit was filed against Toyota and settled out of court. In yet another seat belt case of the Willis Law Firm, a young man was killed in San Antonio, Texas when as a front seat passenger in an older Ford Bronco, the vehicle hit a pole. Though he was wearing the only seat belt equipped for that vehicle, a lap only belt, he was killed when his head and upper torso jack-knifed into the dash and roof pillar, killing him. A seat belt lawsuit was filed and that case was also settled out of court. To see more rollover and seat belt failure cases of the Willis Law Firm, visit our results page for a sampling of past seat belt defect and rollover cases. If you or someone you love has been injured in a rollover or accident and you suspect that the seat belt might have been defective or may not have worked as designed, then talk to a seat belt defect lawyer at the Willis Law Firm today. Let us investigate the facts, the evidence and help determine if a seat belt defect lawsuit may be available to help you and your loved ones get the compensation you deserve. Contact us today by calling 800-883-9858.